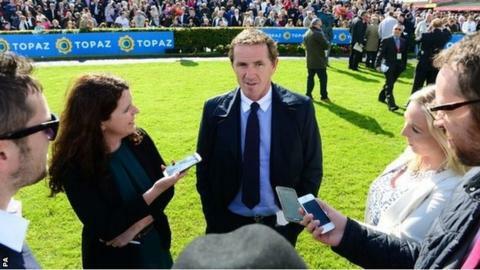 AP McCoy will ride for trainer Brendan Powell when the 20-time champion jockey comes out of retirement for one day to compete in a charity flat race. The 40-year-old, who retired in April, partners Gannicus in Wednesday's 'Legends' race at Doncaster's St Leger meeting (15:35 BST). Rivals will include Johnny Murtagh on the Ian Williams-trained Commissar. Meanwhile, eight horses remain in the Leger on Saturday, after Simple Verse was added to the line-up. Simple Verse, trained by Ralph Beckett, joins the field for a supplementary fee of £50,000 as she bids to become the first filly to win the world's oldest Classic since User Friendly in 1992. Irish trainer Aidan O'Brien has three contenders - Order Of St George, Bondi Beach and Fields Of Athenry. Storm The Stars, third in the Derby at Epsom for William Haggas, is among other leading hopefuls. Meanwhile, former England striker Michael Owen has confirmed his horse Brown Panther will bid to win a second consecutive Irish Leger at the Curragh on Sunday.